MOSCOW, August 28 (Sputnik) — Earlier this month a spokesman for the Russian Northern Fleet said that Russia's Vice-Admiral Kulakov anti-submarine destroyer had also entered the Mediterranean Sea. "The two state-of-the-art large diesel submarines of the Black Sea Fleet, Kolpino and Velikiy Novgorod, which are making an inter-fleet transition from the Baltic Sea to the Black Sea Fleet, have arrived in the Mediterranean… The submarines are expected to become part of the Navy's standing force in the Mediterranean Sea," Trukhachev said. The Veliky Novgorod and the Kolpino Varshavyanka-class diesel-electric submarines with advanced stealth technology joined the Russian Black Sea Fleet in 2016. 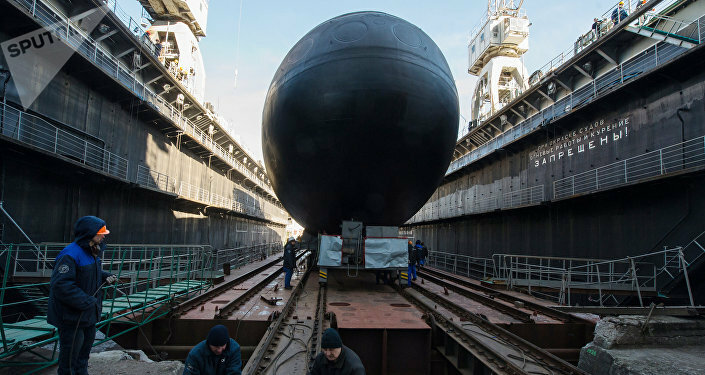 Varshavyanka-class is an improved version of Kilo-class submarines, featuring elements of advanced stealth technology, extended combat range and the ability to strike land, surface and underwater targets. It is mainly intended for anti-ship and anti-submarine missions in relatively shallow waters. The submarines, which can carry a crew of up to 52 people, have a top underwater speed of 20 knots (23 miles per hour), a cruising range of 400 miles (electric propulsion), with the ability to patrol for 45 days. The vessels are armed with 18 torpedoes and eight surface-to-air missiles.